I found this flag at pueblos-de-puertorico.com site (defunct). The five wavy lines on the flag represent the bay of Guánica and the indiginous territory of Guania. It reminds of Tábora, maternal aunt of Don Cristo'bal de Sotomayor. The fortress of Caprón is on the mountainpeak overlooking the bay of Guánica. Guánica was founded 13 March 1914; it is a port in southwest Puerto Rico with 20,509 inh. See also Lexjuris site. 1. the bay of Guánica, from a fragment of the official Coat of Arms of Guánica. 2. the indigenous territory of Guainía, a name undoubtedly related with Guánica's and that Fernando Fernández Oviedo, in his "General History of the Indies", says it means that several gold-rich rivers ran through the region. 3. the Tábora, maternal last name of Don Cristóbal de Sotomayor given to the town by the founder of the bay of Guánica, since among the blazons assigned to the Tábora lineage, of Portuguese origin, ranges one that the heraldist Santos Taveira described as follows: "In golden field, five undulating bands in blue". (It seems that the original shield had this arrangement, instead of the actual three blue bands). 4. Fort Caprón over the top of the same mountain bordering the bay of Guánica, with an elevation of 140 meters (450 feet) over the Caribbean Sea, dominates almost all the Municipality of Guánica and a great maritime extension. It acts like a silent watch-tower over the bay quiet waters where several cultures and races that have shaped the Puerto Rican people have entered through time. (The United States troops entered Puerto Rico through this bay on 25 July 1898 at the Spain-American war). 5. the final embroidery job of the first Official Flag of Guánica was a work of Mrs. Olivia Toro de García and the design of Fort Caprón was a work of Mr. Héctor Luis Zapata. "Shield divided in four quarters. In the superior right side, it has a "bohio" (hut) under a crown that represents Cacique Agüeybaná, whose yucayeque (indian territory) was in this region. In the superior left quarter, a lion representing Juan Ponce de León. The checkered strips over a silver-plated background in the inferior right side represent the shields of Don Cristóbal de Sotomayor, founder of the town of Tavara, the actual location of Guánica. 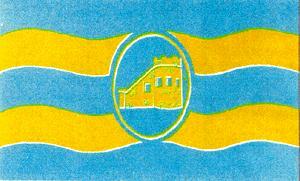 The waved stripes represent the bay of this town. The branches surrounding the shield represent the sugar cane industry that was very important in this region."